We are happy to report that DaVinci synthetic shake shingles as well as our synthetic slate roof shingles have been installed in countries other than the United States. Check out some of our international installations! Canada: DaVinci Shake’s Tahoe Blend on a home in British Columbia, Canada. Japan: DaVinci Slate in Slate Black looks great on this coffee shop in Kobe, Japan. Bahamas: DaVinci Shake in Weathered Gray. 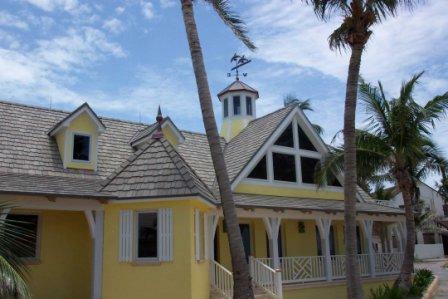 Our polymer roof tiles are a great alternative to traditional roofing products in tropical climates like this one in the Bahamas. American Samoa: Here is our cedar shake alternative installed on one of the government buildings there. Talk about a roof on display! Do you live outside of the United States and would like to look into getting a DaVinci roof? We can help. Please feel free to reach out to one of our project specialists. Do you have a DaVinci roof? We would love to see it and hear about how you found out about us as well as how the roof got to your part of the country. Please share your DaVinci roof story here.